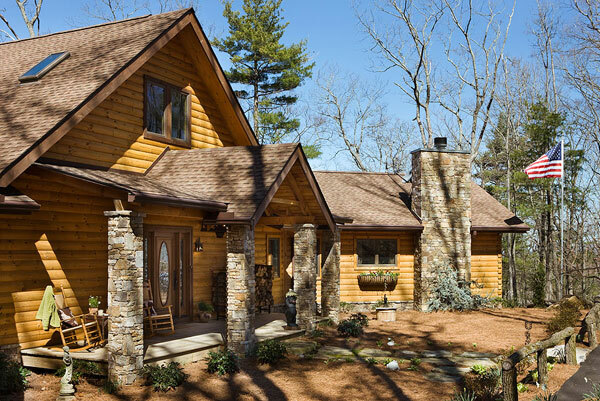 What's Your Log Home Style: Lake, Mountain or Woods? Whether your lifestyle lends itself more to skiing in the mountains or nestling in the woods, you'll want a log home style with both looks and functionality in its design. 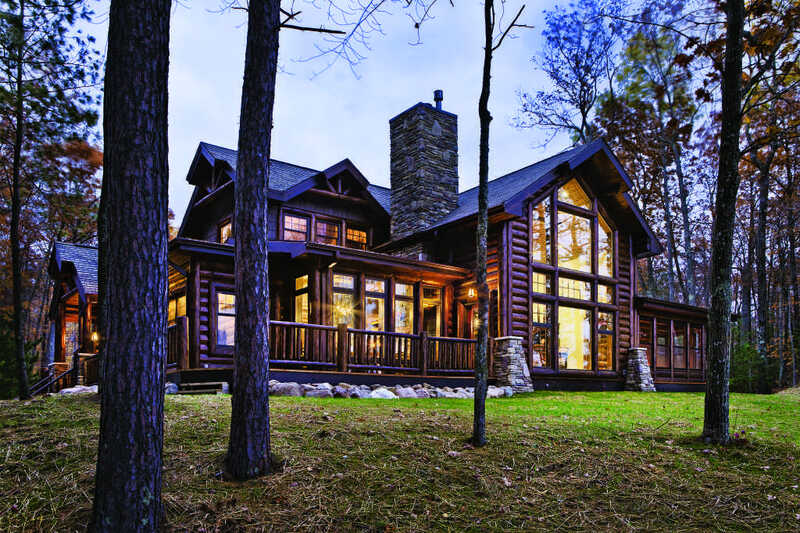 This Wisconsin half-log home delivers full-log satisfaction on 10.5 acres with 300 feet of frontage on Lake Lucerne. Many vacation log home buyers start with magazine photos and stock floorplans, but knowing your own lifestyle will help you make plans that will result in the vacation home of your dreams. "I ask customers to make an index card for each room they think they'll need," says Mary Lee Smyth of Vermont-based Real Log Homes. "Then together, we write down all the activities that will really go on in each room." Other design techniques use bubble charts, flow diagrams, or a list of what you like and what you want in a vacation home. Regardless of the approach, the master key to vacation log home design is to think of your future dream vacation home as a machine in which structure, aesthetics, and human nature come together in ideal working symphony. It's exciting to tempt yourself with photos of palatial vacation log homes featuring every amenity, but knowing your own budget is a foundation of the best design for you and your family. You don't want to spend hours designing a vacation heaven home only to find that such a home isn't financially feasible. "The toughest thing is when a couple comes in with a plan that they've worked on for a long time, and it's a five-gallon house in a three-gallon bucket," notes Mike Oly, vice president of design for Tennessee-based Southland Log Homes. For instance, you may want a great room with a massive stone fireplace and soaring cathedral ceilings, a master suite with his and hers bath and a spa tub, an architectural staircase, and a kitchen with an island, but your budget may mean that you'd have to pack all this into a 900-square-foot log home. Keep costs down by trimming luxuries, reducing the size of the vacation home, and staying within manufacturers' standard log dimensions. You can also get more home for the money by doing some of the construction yourself. Homeowners are often known to do floor tile work, stain logs, and build decks and patios. Other ways to come out ahead include designing the home to have more living space in less expensive areas, such as putting some bedrooms in a basement, or building a one-and-a-half story home with a smaller footprint instead of a more expansive ranch-type that might require more site development and foundation costs. Standing on the deck of their North Carolina log home, overlooking woodlands and the layered vistas of the Blue Ridge and Smoky mountains, these owners are a long way from their home in Gulf Shores, Alabama. But, don't go too far before you have your site. Why? A site with a lake to the north will have different heating, cooling, and weather-protection requirements than a parcel with the lake to the south. A site in the woods will have different moisture-protection needs than a lot perched high on a mountainside. And some communities may have covenants limiting the size of your house or its position on the lot. Of course, many vacation log home lovers already know they are going to build in the woods, near a ski resort, or on a lake, and there are general things to say about the designs for vacation log homes in these settings. Log homes in the woods often aren't directed to face any one direction for the purpose of catching a view. This can mean less emphasis on large expanses of windows. This in turn gives more flexibility to working with the overall design. Accordingly, the interior of the house can be designed with a more natural flow, while still bringing the outdoors in through skylights or through windows on more sides of the room, for the purpose of, say, overlooking a brook, interesting tree, or deer trail. 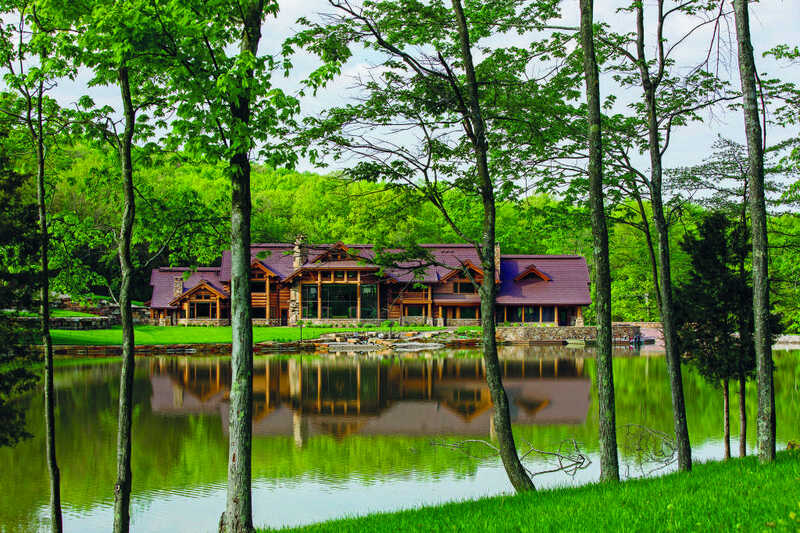 "We often design log homes in the woods with an L-shape, like the crook of an arm," says Alan Halcomb of MossCreek Designs in Knoxville, Tenn., a company specializing in designing milled log homes. "This gives the home a very inviting, almost maternal character that welcomes people in." Nonview lots also may allow more flexibility for necessities such as driveways and garages. Designers do not have to force them into locations based on not blocking the view, so they can place such features where they make the most sense in terms of quick access and easy flow into the house. But remember also that the woods are cool, damp places—which means they are a breeding ground for skin-biting bugs. "The woods vacation home tends to default you into designing in a screened porch," Halcomb notes. And though there's less UV challenge to the logs if you're building in the woods, there is more risk of insect, mold, and mildew unless your logs are well protected with quality preservatives and sealers. Large overhangs help, too, in keeping rain off the logs. Planning your home in the woods to have covered porches, rather than open decks, will also help protect from tree sap, falling leaves, and broken branches taking over your outdoor living areas. But what if your dream is a playhouse perched on the ski slopes, with a commanding view of the resort below and the mountains surrounding you? That's just fine. First, design your home to take advantage of the view as much as possible—some designers suggest arranging the home so that the great room, master bedroom, dining room, kitchen, and at least one guest room have a view. Keep your lifestyle in mind; many ski homes merit an informal plan, with family and guests eating a dinner such as one-pot beef chili or fondue while gathered around the fireplace in the great room. The majestic setting drew the owners to the site and inspired their vision for a home that takes full advantage of the jaw-dropping view. If that's your approach, you might only need a small kitchen and not much of a dining area. Second, plan your access to the ski slopes. Chances are that a mountainside lot will lend itself to a walk-out/ski-out basement. Take advantage of this relatively inexpensive construction, designers say, to have another entryway on the basement level. This would be a good-sized room in which folks departing for or returning from the slopes as a group can put on and take off ski clothing without bumping into each other. Adjacent to or included in the sports entry, a "toy room" is handy for storing skis, snowboards, poles, boots, sleds, and ski waxing/ repair equipment, especially if family and friends include avid sports fans who have more than one set of gear. And note: Near the sports entry, it's also handy to put in a bathroom. Make sure to design for snowloads in your area; plan rooflines and overhangs of three to four feet to shed snow and ice away from chimneys, windows, outdoor traffic areas, and doorways, and have an engineer apply a critical eye to your roof and wall strength —especially if you have walls with a lot of plate glass. Planning a main-floor deck to extend well outward over a sloping lot also can result in a "bonus" covered area for oversized SUVs, snowmobiles, and firewood. And finally, remember that you may often be arriving in icy conditions. Try to keep your driveway level, and either cover or eliminate stairs to the front door, perhaps by incorporating retaining walls into the landscaping to reduce the number of steps. "Another good approach is to design the home with an entry on several levels—basement, a mid-level entryway, and the main floor via the deck," Southland's Oly says. As the proud owner of hard-to-find lakefront property, your goal may be to have a view from every room. But if it's a narrow lot, you may have to prioritize which rooms are lakefront and which aren't. A standard lakefront plan is a central great room and large deck with a view of the lake from the lake side of the house, with the kitchen and dining areas on one side of the great room and the master suite on the other. When you want a waterside home but there’s no water, the obvious solution is to build your own pond, as these homeowners did. That’s lots easier to do than building a mountain for a hilltop home. This kind of plan often puts an additional bedroom either over a garage on the inland side of the home or tucked into a loft. And, with lakefront houses so visible from the water, you may want rooms that require the most privacy, such as bedrooms or offices, on the inland side of the house. "We recommend stepped designs, such as having the great room stick out from the house so that it blocks the main-floor master bedroom from your neighbor's view," says Rick Wright, president of Wright Design Studio in Oregon. Wright also suggests using non-view rooms, such as the garage, to buffer living spaces from neighbors and street traffic. And, naturally, lakefront designers may want to take advantage of their sloping lots to incorporate walkout basements with a large "toy room" and sports entry, making for easier access to the lake. Lakeside entries also benefit from a full bath, to rinse off sand and suntan lotion. "We always advise lakefront customers to design and rough in a bath in the basement when they build, even if they're not planning to finish off the space for a few years," says Tom Seehafer, sales and design consultant for Tomahawk Log Homes. Again, take advantage of decks above the basement level to provide shelter for jet-skis, boats, life jackets, and wet bathing suits. Also, designing a walkout or windowed basement to costar as a playroom for younger guests means there is space in the house for kids to be noisy after supper or on rainy days, while the more sedate members of the family relax upstairs in the great room. Whatever your approach, log home manufacturers and designers agree: You can't start out wrong and end up right, so start out right in the first place. 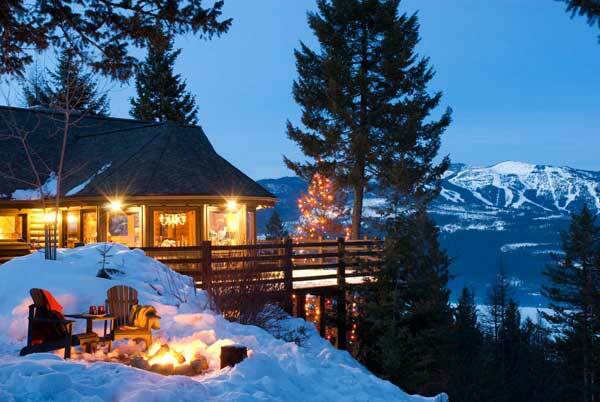 Think long about what you really want in a vacation log home. Then start asking your log home manufacturer representatives lots of questions. Chances are very good that they have heard the questions before and have excellent solutions. That way you will get the vacation log home you've been dreaming about.